Portage District Library serves a population of about 50,000 in the Portage, MI area. It delivers its services with innovative programming, community outreach, technology and business marketing. One of the latest additions to its communications mix is a digital signage system from StrandVision. Using the sign, the library lists meetings and activities, supports library initiatives and provides trivia and other interesting and informative programming. Portage District Library is a dynamic community resource. With approximately 7,000 visitors per week, the library is a focal point for district learning, as well as a meeting place for many organizations. The library staff continually seeks ways to better serve the community and to communicate with patrons. Recently they decided to add digital signs. Laura Wright, the library's Technical Manager, researched digital signage providers. "We looked at systems that were too costly and too complex. Then, we found StrandVision and it seemed to be a perfect fit for us." The library used a local contractor to do the installations. "We pre-staged the content on the StrandVision server before the screens were installed. When we turned the system on, the digital signage started up instantly - no blank screens - no 'under construction' signs. It just works." 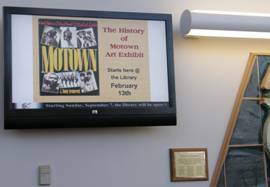 The digital signage system was supported by the Friends of the Library, who underwrote the cost of two large-format plasma television displays. One is located at the entrance/service desk and the other is in the youth department. Library Marketing Manager Chris Larson immediately realized the system's potential. The digital sign could serve a number of marketing, information and community outreach needs. Explained Chris, "We do a lot of signage and flyers in the library, a newsletter for the public and a brochure three times a year. We also have a half page ad that runs weekly in the Portage Gazette and the Hometown Gazette. When you're marketing, it's not just one way." The digital sign doesn't replace any of these communications vehicles - rather, it ties them all together right in the library and allows messages to be reused and reinforced. The StrandVision digital sign carries a range of programming. Of course, it meets the library's initial objective of delivering up-to-date information on meeting room schedules. An administrator prepares the schedule listing community groups, rooms and times. Then, she posts the entire week and the StrandVision system automatically displays each day's schedule. The digital sign also shows local time and weather and a health information feed. On one occasion, when the library was threatened by a tornado, patrons took shelter in the youth department. Library staff logged onto the StrandVision system and within minutes displayed the StrandVision Doppler radar page so everyone had the latest information - an unexpected instant update benefit. Chris manages and updates the marketing information by creating PowerPoint pages, converting them to JPG and uploading them to the StrandVision server. "Basically, once a month I go in and post new graphics and information. I add trivia and community notices, post library hours and holiday closings and other items of interest. "If I've got an event or something to highlight right away, I just go in and add it - it takes me five minutes." She especially appreciates that she can update the StrandVision server from anywhere, describing the utility as "an awesome feature." The StrandVision digital sign is definitely appreciated by the public. Concluded Chris, "We've had lots of compliments and a lot of people have said, 'Wow, this is great!'"